Doesn't Simon look like he was made to do this job? Go on Simon, an hour a day, and Leabank Square will look shining! I'd like to add my thanks to the mayor as well! This is exactly what we voted him into power for! I saw you driving the Leabank Square Dustcart around yesterday cleaning up after some of the macdonalds munchers yesterday. I hope their parents were embarassed having a neighbour of theirs wiping their their teenagers bums. How can they feel it right to bring up kids to just throw litter in front of everbody? I still want a go on the cart though. Have you seen them grumpy old men over at Games Monitor having a right old go at us for wanting to clean our square up? I think they're under the impression that this is council property, and that HC should be doing the job in the 1st place? How comes all these external orgs use our COMMUNITY site to try and set OUR agenda? These Games Monitor 'monitors' are no better than the ODA in criticising us folk in Leabank Square for not joining up with them! HC are so far the only people who help us unconditionally, and when we happen to thank one of them, these crusties get the right old hump! 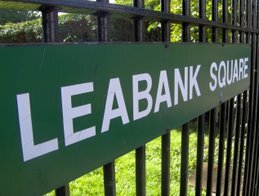 Maybe they should change their name to 'Leabank Square Monitor'. Phil, S sent me the link as well! You'd thing they would have a few other things to 'have a discussion' about than whether or not Leabank Square should clean its own square? They are talking out of their decrepid bottoms anyway, so if this is the extent of the 'monitoring', maybe we should just let them get on with it. Look how good you've got with that shovel/broom combo! A natural! I hope you're going to give the rest of us a chance with it on the Leabank Square Spring Clean Day? Thank you Jules Pipe! We love you!